The Montmartre neighborhood of Paris sits atop a large hill (called the butte, locally) on the north side of town overlooking the city. Traditionally favored by artists and musicians, this picturesque area has been home to painters Renoir, Modigliani, Dali, and Degas (among others) as well as 1950s Parisian songstress Edith Piaf and sculptor Camille Carot. Today, many of the most serious artists have left for Montparnasse and the area is slightly touristy, but a certain Bohemian flavor remains, making Montmartre a must-see on any Paris itinerary. 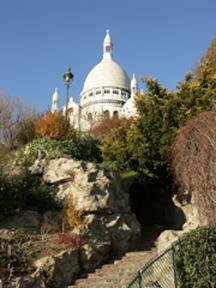 Montmartre started as a wine-growing village on the outskirts of Paris. In fact, the area was only incorporated into the city in 1860. The hill's name is derived from the legend of St. Denis, who is said to have been beheaded there -- thus, the name "Mont of Martyrs" or "Montmartre." The area was also the site of the bloody beginning and end of the Paris Commune (depicted in the musical "Les Miserables"), whose defenders made their last stand atop the hill. The Place du Tertre is the heart and soul of Montmartre. This cobblestone square is lined with sidewalk cafes, restaurants, and beer halls in all price ranges, including the well-known "Mere Catherine," which dates back to 1793. In good weather, you'll find dozens of aspiring artists set up around the square sketching, drawing, painting, and selling their creations to passersby. "Tertre" means "hillock in French and this charming square is the highest point in Paris. Just off of the Place du Tertre is Sacre Coeur (sacred heart) Cathedral. This white, Romano-Byzantine church is visible throughout Paris. The Cathedral, completed in 1914, was built as a tribute to the French victory over the Prussians in the last 19th century. Highlights of the Basilica include its white ovoid dome, the second highest point in Paris (after the Eiffel Tower), the intricate bronze doors which depict the life of Christ, and the colorful Byzantine mosaic of Christ behind the altar. This neighborhood's colorful history has given rise to a dozen of so fascinating and varied museums. Unlike the major museums of Paris, the Louvre and the Musee d'Orsay, these smaller gems are uncrowded and untouristy. Montmartre Museum (Musee du Montmartre) - This charming 18th century house was once home to a variety of artists, including the Impressionist painter Maurice Utrillo. Today, it recounts the history of Montmartre through artifacts, drawings, and photographs. One of the highlights of the museum is a complete reconstruction of the Cafe de l'Abreuvoir, Utrillo's favorite cafe. Max Fourny's Naive Art Museum - Naive Art is the French version of America's folk art. Its simple designs and colorful motifs have a universal appeal. This delighful museum houses publisher Max Fourny's collection of hundreds of paintings and drawings as well as an interactive children's museum with exhibits about conservation issues. Espace Montmartre Salvador Dali - This small museum houses over 300 works by the surrealist, Salvador Dali, who lived and worked in the neighborhood in the early 20th century. Erik Satie's Studio - This tiny museum, reputed to be the smallest in the world, is composer Erik Satie's original studio. Measuring just 10 square feet, it houses original compositions as well as paintings, drawings, and manuscripts from Mr. Satie's famous artist friends. Because of the small space, the collection is rotated regularly. Getting to this exciting part of Paris is part of the fun of visiting the area. First, you take the Paris Metro to the Abbesses station, the deepest station in Paris and one of the few that still sports the original green Art Nouveau grillwork by Hector Guimard. Arising from the Metro, you'll walk a few blocks to the Montmartre funicular, a cable railway that ascends the hill and deposits riders at the foot of the Sacre Coeur. The view of Paris as you climb is spectacular. Steps are available for the hearty, but the climb is very steep.